This week is slim pickins at the Static Podcast. Chris and Val are off this week, no one knows what happened to Koop, so that leaves Podcast Core Members Robert and John to man the microphone. Apparently we failed at that too, because Robert sounds like he is yelling no matter how much John turned down his mic. Even his Gentle Whispering is loud. In this episode, John gets a halftime gig for the 2019 bowl. We discuss the Super Bowl, make some noises with random object, and Robert and John tell knock knock jokes before delving into our favorite YouTube content creators and channels. The podcast is back – this week discussing Ed Sheeran’s propensity to plagiarize and what happens after a band peaks creatively? Are they still good? Find out in this week’s episode! 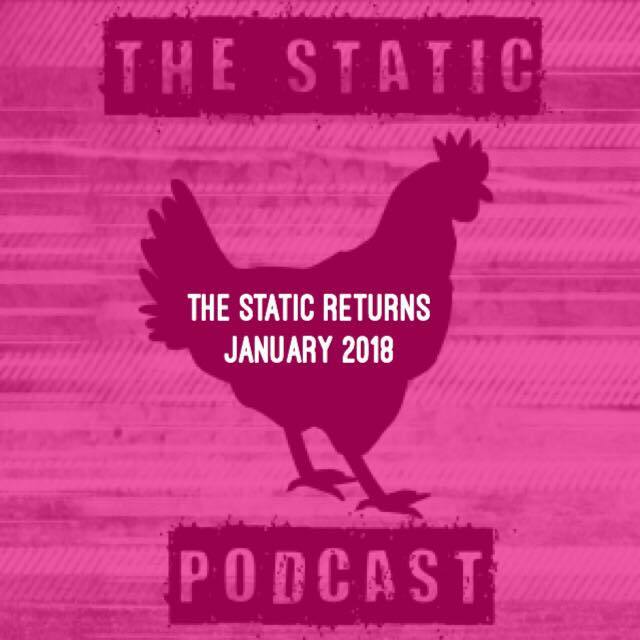 We are back with a reboot of the Static Podcast on Static and Distortion. Our last podcast was April 6, 2016, so its been almost 2 years since we went out on hiatus – with a whimper. Chris rejoins the podcast and Valerie gets promoted to co-host. Of course, John and Robert are back too, with John manning the production side. This week we discuss the song Proud Mary. Who wore it better, CCR or Tina? It’s been a few years since we have heard a hit from turn-of-the-century hip hop sensation Nelly. His latest hit, however, isn’t a collaboration with a younger, fresher artist in an attempt to gain ground in the game. No, Nelly’s latest hit comes to his bank account by way of the IRS and a $2.4 million tax lien from 2013. His last hit albums may have been in 2004 with the dual releases of Suit and Sweat, (Seriously. Those were his last platinum albums. M.O. which was released in 2013 only sold 23,000 copies to date.) but Nelly still has a fan base, apparently, as his fans are banding together to stream his music in order to help him defray the cost of his tax lien. Specifically, fans are turning to what may be his greatest hit, 2001’s Hot in Herre in a campaign to #SaveNelly. According to an article in the Washington Post by Elahe Izadi, fans will need to stream Hot in Herre (or their favorite Nelly track) on Spotify 287,176,547 times in order to pay off the 2.4 million dollar levy. Essentially what this tells us is that Nelly makes $0.008 for every play of one of his songs on Spotify. That’s not even a penny, folks. As of today, Hot in Herre has been played a total of 60,108,586 times which of course includes every play since it became available to stream on the music service. That isn’t even close as it stands right now, although we do not know how many plays Nelly has got since the #SaveNelly campaign went live this week. However, it does mean Nelly has earned $502,301 from this one track alone from Spotify. Fans are making their best attempt to help the rapper defray the cost, but the effect is merely a Band-Aid on the left cheek of his overall tax problems. 1.) Does Nelly really have that many fans to rally together to put their efforts into saving him from his IRS issues? 2.) How many people are just doing this because its a fun thing to do on the Internet? Has the hashtag campaign really brought such public awareness that people are jumping on the bandwagon to stream his music? The thing is, streaming a song, however noble, does not require anything of the person doing it. It costs the listener nothing. There is little investment on the listener’s part. I’ve written before about cost to a consumer vs. their investment in an artist/event/movement. This isn’t a Kickstarter or GoFundMe campaign where someone is trying to fund an album by giving things away to a person who will put up cash to see a project completed. That is a way to gain invested fans. But is this #SaveNelly campaign indicative of how to leverage existing fans? Or,is this just people on the Internet getting a little chuckle about referencing a hit they remember from college and throwing up a hashtag on Twitter? Apparently, Nelly is beloved by enough music fans in 2016 to start a movement, but I question whether this is a noble gesture. I suspect the #SaveNelly campaign will be hot (in herre) on Internet news feeds for a few days, then people will go back to forgetting about Nelly. Meanwhile, he will have to pay future tax on his $0.08 earning on each new play his fans are doing to help him. Ok, so my natural instinct is to go skeptical. But, when I think back to what I was listening to from 2000-2006, there was a lot of Nelly on my iPod. I really was a fan of his first album, before the Hot in Herre era, and I loved a lot of the music off Nellyville and Sweat/Suit. Maybe it takes no investment to play a few tracks on Spotify, but maybe that’s the key thing about this movement. It cost nothing, it helps out an artist who’s music played a pivotal role many people’s hip hop education, including my own. Nelly might not be tearing up the charts these days, but he was at least relevant enough in the lives of his fans that they want to give the guy a hand when he is down. I highly doubt that the #SaveNelly campaign will make a dent in his tax problems. But maybe the gesture is one of the most beautiful things to take place in a world full of skepticism and negativity. All that being said, I personally contributed $0.024 cents towards the goal to #SaveNelly. You know, because sometimes you just have to give back. During the 2016 Rio Olympics, McDonald’s released a commercial that made me swell with manly tears the first time I saw it. The commercial features a split screen, on the left, a little boy clearly growing up in the 80’s playing and doing activities in which he passes the game or item across the split screen to a little redheaded girl. The little girl is clearly living in 2016. He hands her an Atari controller, it becomes a contemporary game system controller. He passes her his stuffed puppy, and it becomes a real puppy. Everything he passes to her is slightly better than what he had in the 80’s. In the final scene, you see the little girl excitedly waiting for the little boy to join her in the left screen. The boy sits down, pulls out a chicken nugget, then passes it across the screen to the little girl. The little boy from the 80’s then slides himself across the split screen into 2016 to reveal, he is her father. On the face, this is a really clever and effective commercial appealing to people my age (I turn 35 on September 12) who have kids who are 7 or 8 like the adorable little redheaded girl in the commercial. Our generation is a fickle one. We are the generation of natural cleaning products, GMO free foods, minimally processed snacks, and such. We are the generation that is likely the cause of McDonald’s recent struggles in the marketplace. We have drifted from McDonalds to Chipotle because of the promises of the burrito makers of providing hormone free, responsibly raised, local foods for their offerings. McDonald’s has been hurting lately, most likely because our generation and the Millenials coming behind us have better options than the fast food stalwarts like McDonald’s and Wendy’s and Burger King. Burger King has gone the route of offering hot dogs and (god awful) Whopperito burritos to attract new customers. The purpose of this McDonald’s commercial is to feature their chicken McNuggets, now with 100% all natural white meat, no artificial colors or flavors. The commercial does a great job of reminding us 30-something dads of the childhood we experienced frame-by-frame, showing how a dad can relate his childhood to his daughter (or son) According to this commercial, fundamentally, nothing has really changed. I remember so many birthday parties at McDonald’s and eating so many chicken nuggets over the years as a kid in the 80’s. Its the same experience when my kids beg for Happy Meals that my parents experienced – however, McDonald’s also appeals to the old adage that “we all want better for our kids.” Now we can share the experience we had growing up with our kids, and our kids have it better than we did. This commercial brought me to tears the first time I saw it. It touched that part of me that always aches for nostalgia. It appealed to my childhood. It appealed to my fatherhood. But this time, the sheer timing of this commercial hit me the hardest. After 10 years living in the Chicago area, I just relocated my family back to my old hometown in the middle of rural “look out for Amish buggies” Ohio. My kids were born and raised as Chicago suburban kids. This is a big change for them. For me, its a homecoming of sorts. I grew up in Ashland, Ohio, moved away, then moved back for college, where I met my wife – their mom, who also grew up here. Then we got married and moved to the big city. For us, its a bizarre juxtaposition of lives. This is where we were kids and where we grew up. We went to those birthday parties at McDonald’s when we were in third grade. Now my third grader lives here. He begs for Happy Meals at least a few times a month. The night I first saw this commercial, I had just gone with my wife to the ice cream shop in the park by the house. I grew up in a 60’s ranch house up the hill from the ice cream shop and got ice cream there regularly as a kid. It was across from the softball diamond where my dad played church league softball several nights a week. It is down the hill from the municipal swimming pool where I spent literally every day of the summer. It is across the street from the mini-golf course where my wife worked in college when we were dating. I spent hours sitting in the little red shed with her as she waited for patrons to come pay their dollar to rent a putter and a ball. I got the same ice cream flavor I lived on as a kid. I sat there, eating ice cream with my wife, sitting on the familiar picnic tables, taking in the scene. Nothing had really changed in 25 years. It was fundamentally the same. All of my memories of growing up in this neighborhood next to the park were completely in tact. I had just taken my kids to this park earlier in the day and let them wade into the creek where my brother and I used to overturn rocks and catch crayfish and minnows. My son spotted a few that day. Then, I came home that night, ate dinner, cleaned up, got the kids in bed and flipped on the TV and saw this commercial. Tears. I usually kind of tune out commercials, but being an Iron and Wine fan, I recognized Sam Beam’s whisper immediately. It caught my attention. He is singing one of my all time favorite songs – Time After Time. I love Cyndi Lauper’s original, I love covers of the song. It holds up no matter who is singing it. Its a powerful song. My wife just had this same odd experience when we took my daughter to sign up for dance classes at the dance studio where my wife danced when she was a little girl. We searched the hundreds of photos on the wall of the reception area looking for all the pictures that mom was in when she was a kid. My wife said the place was exactly the same as it was 20 years ago when she danced there. I can’t fully explain what this feels like. Between one of my favorite artists singing one of my favorite songs and the little redhead girl who melted my heart because she reminded me of my own little redheaded girl who melts my heart, this commercial got me right in the feels. All of the feels, really. Its comforting and disorienting to have my children actually experience my childhood themselves. I didn’t have that in Chicago. That was a whole different ball game. I had no touchstones to a childhood there. My kids were having a childhood that was completely their own. Now they are having mine. And hopefully, it’s fundamentally the same, but incrementally better than my own childhood. Of course, times have changed. But my kids and I still wear matching Chuck Taylor’s from time to time.